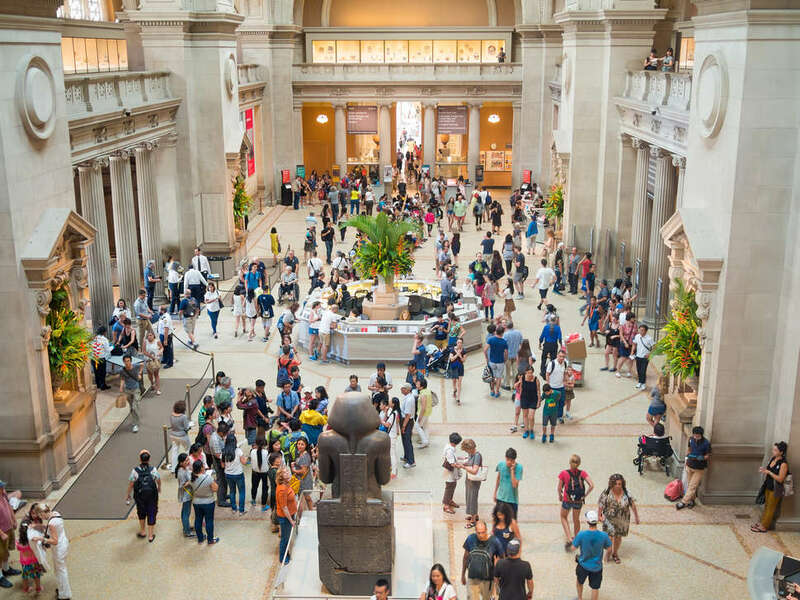 New York’s most famous museum, the Metropolitan Museum of Art, is home to over 2 million artworks, spanning more than 2 million square feet of Upper East Side real estate and 5,000 years of art history. 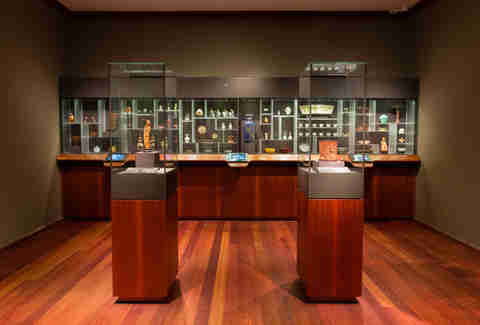 And while the majority of the Met’s collection is in storage (both to protect light-sensitive pieces that are rotated out of permanent exhibits and merely due to lack of physical space), it would take you over 1,666 hours -- or 694 sleepless days -- to look at each piece for even 30 seconds. 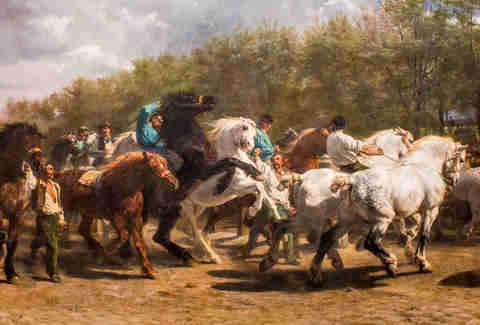 Especially if you find yourself at the Met on a busy day, skip the overcrowded halls full of famous paintings you remember from art history class, and instead take advantage of some of the museum’s lesser-known treasures, which you can often enjoy in near solitude. 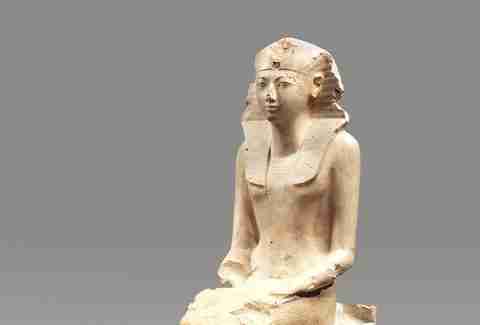 We spoke to Met employees and Andrew Lear of Shady Ladies Tours to get their takes on the Met’s most overlooked works in the Asian, Egyptian, European departments. Don’t worry, Monet’s "Water Lilies" and the Temple of Dendur will still be there when you’re done eying these. 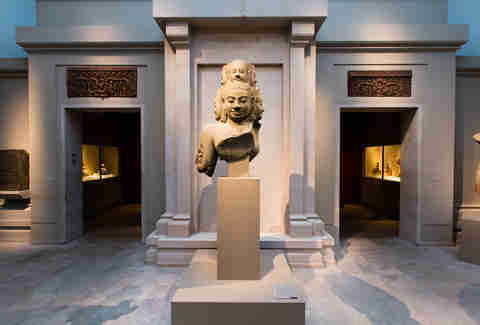 Thanks to its home in the furthest northeast corner of the Met -- basically the Astoria of the museum -- this tantric god rarely gets a much-deserved visit. The impressively tall hand-chiseled statue is believed to have been polished with sand, but its simplicity also makes the large-scale work even more powerful. Like similar Buddhist images, this deity is sitting at the center of the universe, but looking in all four directions, which can also provide the idea of emptiness -- like when your nose is glued to your phone and you’re missing the splendor of artwork right in front of you. Just past a dimly lit display of Chinese textiles is an oft-overlooked and wonderfully quirky room filled with irregularly sized open cabinets (think the IKEA room divider you used to turn your first Downtown studio into a two bedroom) holding tiny treasures made of ivory, rhinoceros horn, glass, jade, porcelain, and more, emulating the style in which these tiny collectable works would be showed off at the homes of scholars and wealthy elites in China circa the Ming (1368-1644) and Qing (1644-1911) Dynasties. Take some time to admire the sophistication and extreme details of these pre-industrial, handmade artworks. If you look closely, you’ll find tiny fruits, a decomposed skull, and other super refined artworks on a seriously tiny scale. Delete that meditation app and stand in front of this Korean bronze Buddha dating back to the 17th century. 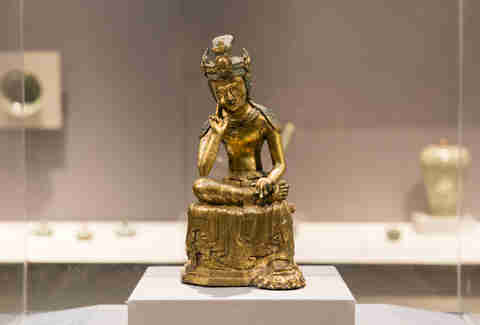 This sculpture shows a Buddha of the future, up in heaven like a god, in fancy clothing and jewelry, contemplating the meaning of existence as he presses his fingers to his cheek. 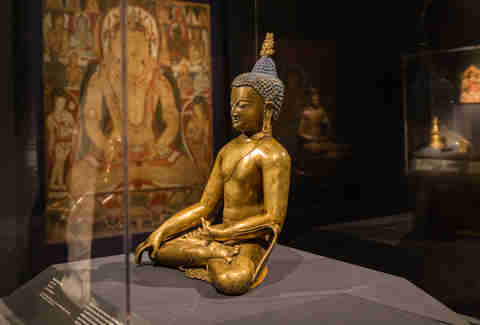 “After Buddhism is completely lost and forgotten, he’ll come to Earth and again reveal the path to enlightenment,” Kurt Behrendt, Associate Curator of Asian Art at the Met, explains. “By focusing on the image you’re having access to a god that is living.” In other words, brace yourself for enlightenment. 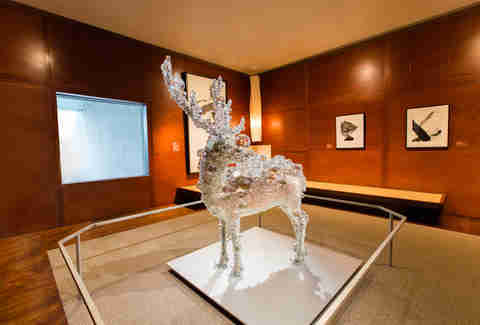 The coolest piece of taxidermy you’ll ever see, this 2011 piece by Japanese artist Kohei Nawa is not to be missed. Be sure to look into the deer’s glass eyes through one of the various shaped glass spheres. This 12th-century Buddha is known as the Buddha Shakyamuni, reaching down and touching the earth at the moment of his enlightenment. This is the instant when he becomes the Buddha. Most amazing about this sculpture are the details like the fleshy fingers and toes, and the sensitive, sophisticated expression on Buddha’s introspective face (for the time period, details like these are pretty unusual). 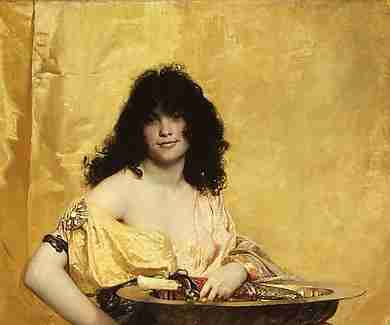 “The scale of the cast image and its subtlety make it one of the great masterpieces of New York,” Behrendt says. 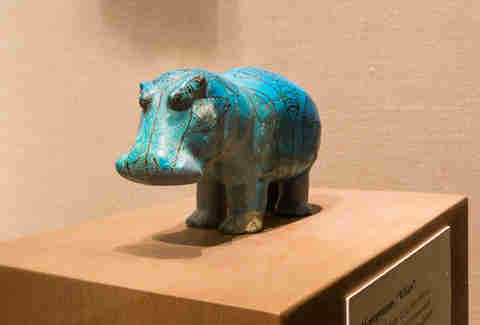 You’ve probably seen this hippo (nicknamed William) -- the Met’s unofficial mascot -- on merch and promotional materials since the first time you walked up the museum’s iconic steps, but did you ever consider that this animal sculpture is actually part of the collection? The tiny rhino is dyed blue with indigo, and if you look from the side, you’ll see that the hind legs are reconstructed. That’s because the ancient Egyptian owner of this amulet probably snapped the back legs of this dangerous animal off, to show that the owner of this hippo statuette is in charge, though the hippo can still harm others. Think of this cute little guy as the OG doorman. Circa 2051 BCE, King Mentuhotep II built temples for himself and his wives, including the one pictured here, Queen Neferu. 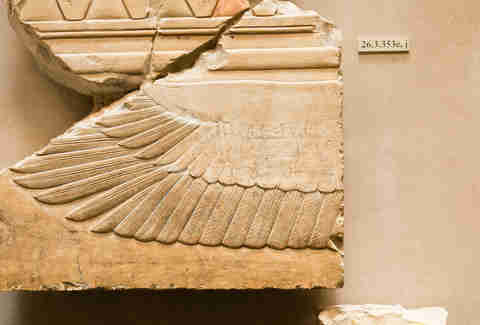 This temple fragment comes from excavations, but according to Niv Allon, Assistant Curator in the Department of Egyptian Art at the Met, the most interesting part of this piece is what came 500 years after it was made. The ancient script written in black ink left on the fragment isn’t vandalism, but rather a show of admiration from a visitor to the temple. “It’s a way of showing that you’ve been to the place, you like it, and want to inscribe yourself for the future on it,” Allon says. In this room dedicated to the first female pharaoh, you’ll see statues of Hatshepsut in both masculine and feminine forms. 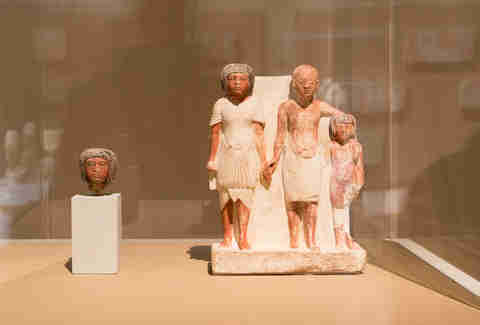 When these statues were found in the late 1920s, they were all together, broken up, in a pit (some jerk had dragged them out of Hatshepsut’s temple, smashed her likeness to pieces, and put the remnants in a pit). 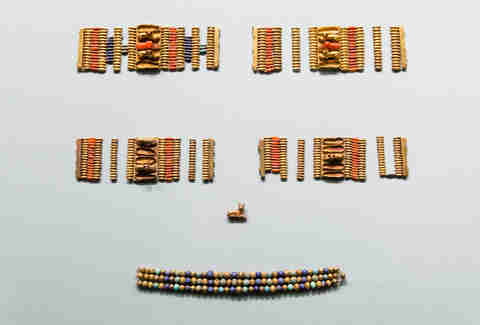 The Met put all of them back together, and if you look closely you can see how they were reassembled. Though the stones are colorful in themselves, when you’re close you can also see remnant of pigment which would have made these statues even more colorful and elaborate. In 1920, the museum went to Egypt on a mission to increase its Egyptian collection, during which excavators visited a tomb originally thought to be empty and stumbled upon a brick wall. After removing the bricks, they found tons of ancient boat models, completely untouched since 1975 BCE. On the wall of this gallery, you can see photos of what the excavation looked like, but certainly more interesting are the diorama-like scenes created solely from ancient materials. None of the pieces were to be seen by people -- they were meant for the afterlife. 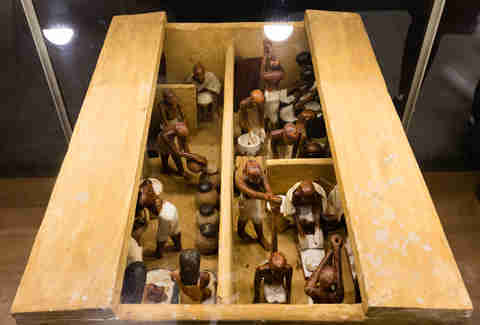 In the scenes, you’ll see daily life in ancient Egypt, such as cattle being butchered and dried for meat, a grainery with figures making bread, and a brewery, because what’s the point of an afterlife without any beer? Any organic material that went into these creations most likely disappeared over time, but paints from minerals, ochre and carbon still color the figures today. At first glance, this may just look like a piece of old jewelry you’d find in your grandma’s nightstand, but this ancient cuff has some very stylish felines popping out of it. In ancient Egypt, cats were often associated with the goddess Bastet (unlike in ancient Greece, Egyptian gods and goddesses weren’t necessarily correlated to a certain earthly element) and were also popular pets. Look closely on the shelves of trinkets to find this tiny treasure. 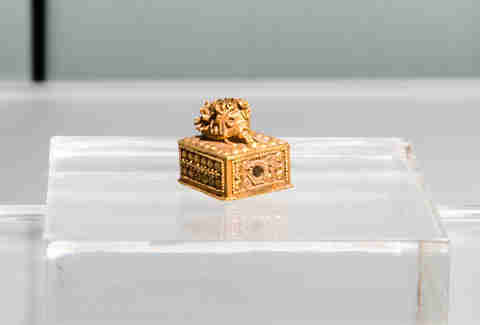 You’ve probably never seen this impossibly minuscule hedgehog before, A) because it could fit on a quarter and B) because it’s incredibly easy to miss when you’re surrounded by mummies and recreated tombs. Still, its incredible detail is seriously impressive, considering ancient Egyptians didn’t have magnifying glasses or really any tools closely resembling what jewelers would work with today. Seeing two men holding hands is extremely rare in Egyptian art (especially with a third figure in the image), and Allon points out that this work was done with incredible attention to detail (look at the hair strands), which makes the piece especially notable. This oil painting dates back to 1778, when Gainsborough painted this great courtesan of 18th-century London and Paris. 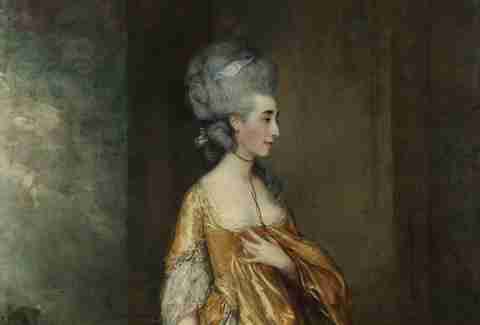 The full-length portrait -- commissioned by the Marquess of Cholmondeley -- is a staple stop on Professor Andrew Lear’s Nasty Women of the Metropolitan tours. “Grace's most interesting side was probably her staunch and gutsy monarchism during the French Revolution,” Lear says. This got her imprisoned, though she did escape the guillotine, which is a pretty impressive feat. 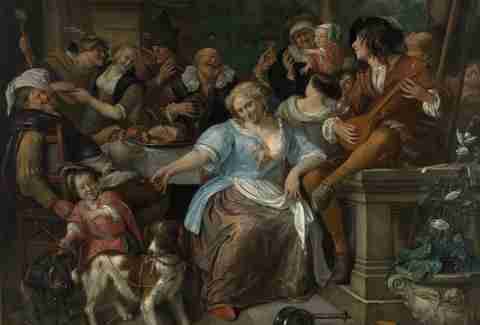 If you’re on the lookout for a mess of a party at the Met, look no further than this late 17th-century oil painting, which Lear says is a good example of the “often-ignored racy side of Dutch Golden Age painting.” So what are you looking for here? “The woman in the center of the scene is misbehaving as she leans on the thigh of the young musician to her side, out of whose lap a lute juts in a pretty obviously phallic manner,” Lear says. Sure, this may look like a screenshot out of a Lifetime movie, but Cassatt’s domestic portraits have significant importance in their time. “Today, Cassatt's paintings of women can seem very conservative, but in fact they are early examples of work that insists on showing women in their real lives, not idealized for male viewers,” Lear explains. 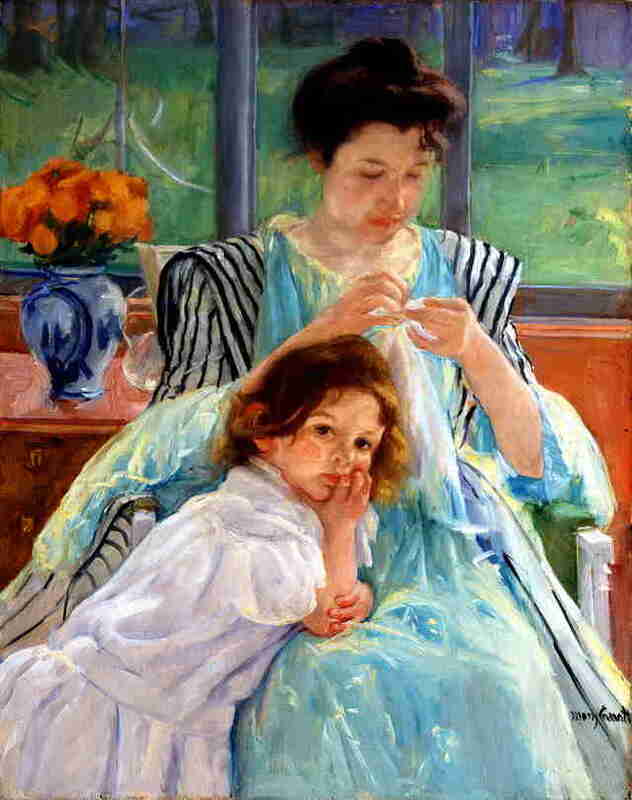 “This mother, for instance, with her slightly out-of-place hair, and her apron, is shown sewing with her daughter leaning against her. She doesn't stop sewing, showing that she is used to children leaning against her, as real mothers are.” Lear also notes that Cassatt, and her friend Louisine Havemeyer, who donated many of her masterworks to the Met upon her death, were both ardent suffragettes. Melissa is a writer living in New York City who wanted to be an art history major but opted for the more practical department: creative writing.